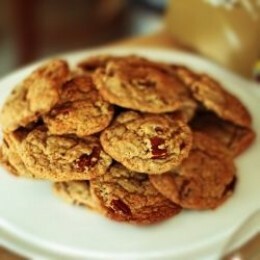 These maple pecan cookies are perfect for holiday gatherings. They take only twenty minutes to prepare, and are ready to eat in half an ho ur, so if you have unexpected visitors they’re easy to make from store cupboard ingredients. You can flex the recipe if you like. If you don’t have pecans, you can substitute walnuts for a similar appearance. If you don’t have walnuts then chopped hazelnuts or almonds will still make a good cookie. I use brown sugar and wholewheat flour because I think they give the cookie extra nutty flavor and they add a more interesting color, but white will work just as well. Do use real maple syrup, it does make the cookie, and you don’t need much. If you can get your hands on the really good stuff from Michigan then do, otherwise I hear Vermont and Canada produce syrup too.